Understanding Chinese policy of “Thank God, Our tyrant is gone. I am your new tyrant”. You are welcome to reblog this article in full and disseminate it widely. The mentality of Chinese Imperialism is that when a mutual tyrant has been defeated, a Chinese will have to become the new tyrant to rule his former comrades in arms. 1. Different mentalities in different cultures. There is a Western fable about an Old Woman wishing longevity to a ruling Tyrant: The tyrant questioned her “Why do you want me blessed why all others want me cursed”. Her reply was “Every time we get a new tyrant, things get worse”. Chinese Imperialist mentality can never understand this humour. Indeed, Western influenced Vietnamese from the South always have good laughs at the irony of “Thank God, Our tyrant is gone. I am your new tyrant”, while Chinese influenced Vietnamese from the North always ask why do people from the South laugh. 2. Historically recorded Chinese actions based on their policy of “Thank God, Our tyrant is gone. I am your new tyrant”. 2a- When the Mongolian forces attacked Northern China, Vietnamese Kings of Tran dynasty at that time were more on the side of Southern Song of China. However when the Yuan (Mongolian) empire has disintegrated, the Ming dynasty of China wanted to be the heir in succession to the empire, wanted and made many attempt to force Vietnam to be its colony. China was not successful until a Ho Quy Ly usurped the throne of the Viet King but subsequently surrendered to China. China’s rule on Vietnam was later overthrown by the Vietnamese hero of modest origin Le Loi, who later proclaimed himself to be King of Dai Nam (old name of Vietnam). China threatened a military invasion. Fortunately for Outer Mongolia, it got the backing of USSR. The threatened military invasion of Outer Mongolia by China was neutralized by the military might of USSR. 2c- After the Quin empire was dissolved, the Peking government wanted to be the heir in succession of the empire and wanted to force Tibet to be a vassal state of China. The Tibetan leaders refused. China threatened a military invasion. Unfortunately for Tibet, it was alone and got invaded and occupied by China. 2d- After the Japanese empire surrendered at the end of WW2, it relinquished all controls and sovereignty claims on all occupied lands. The collaborating (?) Chinese local government in Taiwan denounced Japan for the Nanking massacre but wanted to keep on having the Paracel and Spratly groups of islands annexed from Vietnam by Japanese empire in WW2. 3. Serious threat to peace and stability by Chinese policy of “Thank God, Our tyrant is gone. I am your new tyrant”. Having failed to convince many nations with FALSE information that China administered the Paracel and Spratly groups of islands since antiquity, China then FALSELY claimed that they had been given to China by France. The second attempt by China also failed and China now wants to apply its laughable justification of “Thank God, Our tyrant is gone. I am your new tyrant” to keep the groups of islands annexed by the Japanese Empire from Vietnam and incorporated into Taiwan while denouncing any Japanese annexation of Chinese territory. In 1951, at the international Treaty of San Francisco conference, Vietnam’s representative claimed that both the Paracels and Spratlys are territories of Vietnam, and was met with no challenge from all nations at the event. However, neither the PRC nor the ROC participated in the conference. Separately, the ROC negotiated and signed its own treaty with Japan regarding the islands on April 29, 1952. When allying with China against any mutual tyrant, the smaller nations must be aware of China’s ambition and must have plans to deal with their Chinese ally (such as suddenly forcing a disarmament of the “ally” to force the withdrawal of Chinese troops after peace). Many small Asian nations are now taking on huge risk allying with China against some unworthy grievance or nuisances. USA is now learning to its own cost for having a hubris to stand over the Soviet Union against its plan to denuclearize China, for allying with China against the less aggressive opponent Soviet Union, and for transferring (through claims of “thefts from USA”) of nuclear and missile, defense technology. France had NOT given to China Paracel and Spratly Islands. The dispute in the South East Asian sea is causing high tension and people want to know how had such a dispute arise and why had China used military force to capture some islands from the Republic of Vietnam in 1972 and then some more islands from the Socialist Republic of Vietnam. (China justification had been reflected in a Wikipedia entry: Battle of the Paracel Islands, https://en.wikipedia.org/wiki/Battle_of_the_Paracel_Islands ). This blog gives an assesment of Chinese justification for its capturing of these islands. The Wikipedia entries on Paracel and Spratly Islands contain statements giving the FALSE impression that France had given the Paracel and Spratly groups of islands to China in 1884. There are groups of islands named Hoang Sa and Truong Sa that have been administered and economically exploited by Vietnamese at least since the time of Vietnamese King Lê Thánh Tông (1460 – 1497). 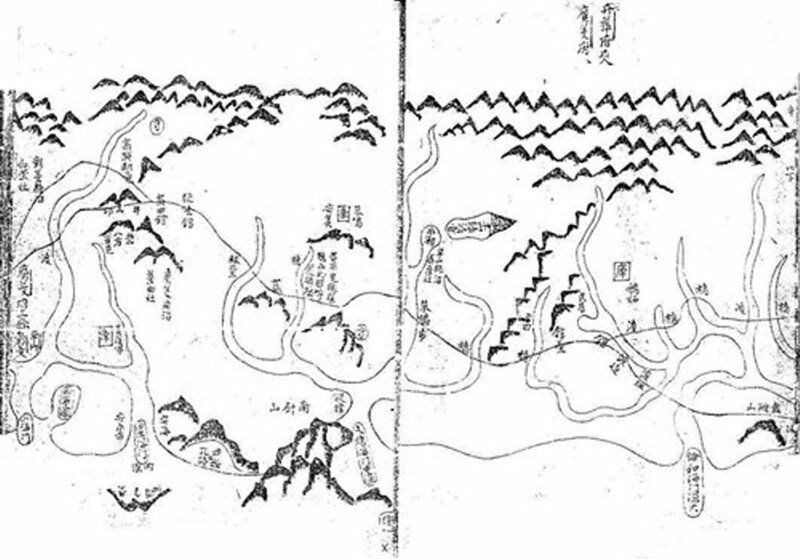 Figure: Map of Vietnam under King Minh Mạng (1820-1840). Figure: Map of Vietnam (Empire d’ Annam) in French records. Dai Nam Nhat Thong, entire map of “Great Southern country”, of King Minh Mang expresses the sovereignty of Hoang Sa, Truong Sa of the Vietnamese. Under the reign of King Minh Mang, the improvement of boatbuilding technology for seafarers has been carried out extensively. Not only increased the number, but the king also increased the type of boat. According to the Book of Indescribable Dignitaries, in the Year of the Rat (1828), the King set the class of boats (setting the number of boats to be closed) in the locality. The marine regulations were also improved by Minh Mạng, he set size and style for each class of boats, united in the whole country to the boat workshops according to that standard that closed. In particular, King Minh Mang had built a boat of copper and steamboat in the French model. Minh Mang’s special interest in shipbuilding not only serves the purpose of economy, trade and technology development, but also builds a powerful navy with great strength and capability in Setting up and protect the sovereignty of sea islands. Even in 1839 he ordered references to Western documents to compile books on naval warfare, naval maps then for soldiers to practice and practice. Following the implementation of the sovereignty of Hoang Sa, Truong Sa from Gia Long, under the Minh Mang reign, the ships patrolling and surveying the Hoang Sa will be carried out in the spring. . According to different documents, this activity was carried out within 6 months, despite the year due to rain and wind, the storm had to go back, but the mission of the boat remains unchanged. In addition to the exploitation, the sea guard, Minh Mang also conducted the construction of places of worship (pagodas, shrines), planting trees, building columns, sovereigns in some islands in the year (At Mui (1835), Binh Than (1836)). Apart from activities to protect sovereignty and exploitation of marine resources, King Minh Mang ordered the navy to rescue and assist the ships of any country in distress in the waters of Vietnam. As in the year of Bân Than (1836), a British merchant ship hit the Hoang Sa, rescued more than 90 people to bring food and water to the coast of Binh Dinh to give them back home. These showed that Emperor Minh Mang not only inherited but also developed sea strategy of the previous dynasty to a new height, affirming the national strength in the South China Sea, further strengthening the position and sovereignty in the islands in general and Hoang Sa, Truong Sa archipelago in particular. It shows that the sacred land in the East Sea is eternally Vietnamese.
. External Sources, the sources are not mentioned at present to protect their websites and authors. positioning the islands was due to the relatively primitive scientific and navigational technology of the time. 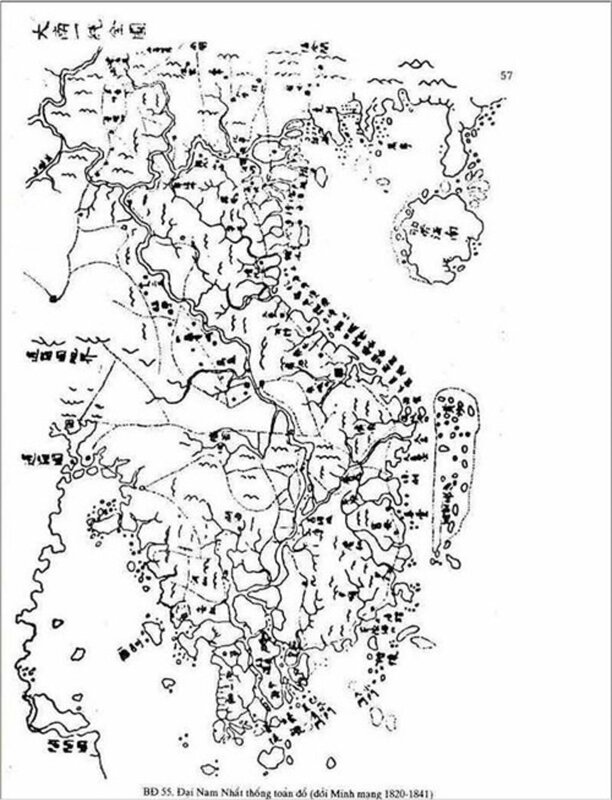 In addition, the Europeans grouped both the Truong Sa and Hoang Sa archipelagoes together into a single island chain called the Paracels. contain statement giving the FALSE impression that France had given the Paracel and Spratly groups of islands to China in 1884. That entry gave the FALSE impression that French Empire had given the Paracels and Spratly Islands to China and is TOTALLY BASELESS. China first asserted sovereignty in the modern sense to the South China Sea’s islands when it formally objected to France’s efforts to incorporate them into French Indochina during the Sino-French War (1884–1885). 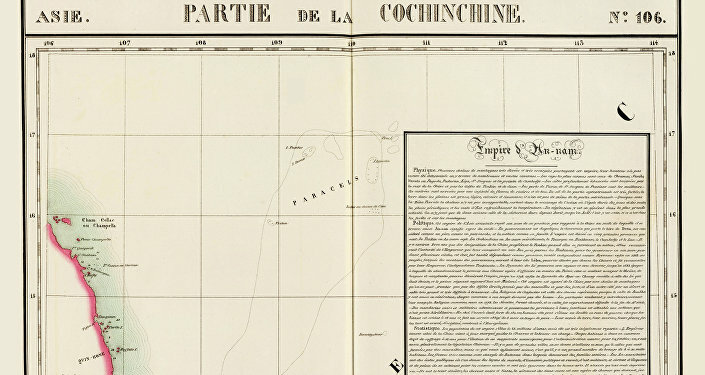 Initially, France recognized Qing China’s sovereignty over the Paracel and Spratly archipelagos, in exchange for Chinese recognition of Vietnam as a French territory. Chinese maps since then have consistently shown China’s claims, first as a solid and then as a dashed line. 3. Rejection of a false claim on territorial exchange/concession. a- Possession the Islands by the donor at that time of 1884: France has never possessed the Islands. b- There must be substantiated records of the exchange/concession. 4. Had the French Empire got good ownership of the Islands ? No. According to the treaty of Hue (1984) France guaranteed the integrity of Vietnam. Article 15. France undertakes to guarantee henceforth the integrity of the realms of His Majesty the King of Annam, and to defend this Sovereign against all external aggression and internal rebellion. To this effect, the French authorities may station troops at whatever points in the territory of Annam and Tonkin they judge necessary for the effective functioning of the protectorate. So France had no territory to give to China. According to the Harmand treaty (1883)  which was not ratified by the French Parliament and its updated Patenotre treaty (1884) , there were no ceding of any Vietnamese Islands to France. Art. 15. La France s’engage à garantir désormais l’intégrité des États de S. M. le Roi d’Annam, à défendre ce Souverain contre les agressions du dehors, et contre les rébellions du dedans. A cet effet, l’autorité française pourra faire occuper militairement sur le territoire de l’Annam et du Tonkin les points qu’elle jugera nécessaires pour assurer l’exercice du protectorat. En cas de contestation le texte français fera seul foi. In the event of a dispute, the French text shall prevail. So France had nothing to give to China. So regardless of whatever treaty between China and any other country, as may have been claimed by Quin Dynasty, the sovereign of the Island still belong to the Vietnamese king and any claim by China has no standing. 5. The cited Tientsin Accord has nothing on any territorial concession/exchange between France and China. On 6 June the French followed up their accord with China by concluding a fresh Treaty of Huế with the Vietnamese, which established a French protectorate over both Annam and Tonkin and allowed the French to station troops at strategic points in Vietnamese territory and to install residents in the main towns. The claim was all based on a single book published in 1934 by Thomazi [Thomazi, A., La conquête de l’Indochine (Paris, 1934) 189–92], published a long 50 years after the 1884 dispute and the Tientsin Accord,. Someone please provide more details on those pages of that book! Vietnam and France claimed no Islands have been given to China. To prove the point, France has declared its control over the Islands in 1932. In 1932, one year after the Japanese Empire invaded northeast China, France formally claimed both the Paracel and Spratly Islands; China and Japan both protested. In 1933, France bolstered their claim and seized the Paracels and Spratlys, announced their annexation, formally included them in French Indochina. They built several weather stations on them, but they did not disturb the numerous Chinese fishermen found there. Indeed the entirety of the Tientsin Accord is printed below and readers can see that all claims that France has given the Islands to China are baseless. Art. 1. La France s’engage à respecter et à protéger contre toute agression d’une nation quelconque, et en toutes circonstances, les frontières méridionales de la Chine, limitrophes du Tonkin. Art 2. Le Céleste Empire, rassuré par les garanties formelles de bon voisinage qui lui sont données par la France, quant à l’intégrité et à la sécurité des frontières méridionales de la Chine, s’engage : 1° à retirer immédiatement, sur ses frontières les garnisons chinoises du Tonkin ; 2° à respecter dans le présent et dans l’avenir, les traités directement intervenus ou à intervenir entre la France et la Cour de Hué. Art. 3. En reconnaissance de l’attitude conciliante du Gouvernement du Céleste Empire, et pour rendre hommage à la sagesse patriotique de Son Excellence Li-Hong-Chang, négociateur de cette convention, la France renonce à demander une indemnité à la Chine. En retour, la Chine s’engage à admettre, sur toute l’étendue de ses frontières méridionales limitrophes du Tonkin, le libre trafic des marchandises entre l’Annam et la France d’une part, et la Chine de l’autre, réglé par un traité de commerce et de tarifs à intervenir, dans l’esprit le plus conciliant, de la part des négociateurs chinois, et dans des conditions aussi avantageuses que possible pour le commerce français. Art. 4. Le Gouvernement français s’engage à n’employer aucune expression de nature à porter atteinte au prestige du Céleste Empire, dans la rédaction du traité définitif qu’il va contracter avec l’Annam et qui abrogera les traités antérieurs relatifs au Tonkin. Art. 5. Dès que la présente Convention aura été signée, les deux Gouvernements nommeront leurs Plénipotentiaires, qui se réuniront, dans un délai de trois mois, pour élaborer un traité définitif sur les bases fixées par les articles précédents. Conformément aux usages diplomatiques, le texte français fera foi. Fait à Tien-Tsin, le 11 mai 1884, le dix-septième jour de la quatrième lune de la dixième année du Kouang-Sin, en quatre expéditions (deux en langue française et deux en langue chinoise), sur lesquelles les Plénipotentiaires respectifs ont signé et apposé le sceau de leurs armes. Chacun des Plénipotentiaires a gardé un exemplaire de chaque texte. Signé : Ll-HONG-TCHANG. Signé : FOURNIER. So all claims on possession by succession by China are unsubstantiated ! In 1933, France bolstered their claim and seized the Paracels and Spratlys, announced their annexation, formally included them in French Indochina. They built several weather stations on them, but they did not disturb the numerous Chinese fishermen found there. The statements presuppose that the Islands did not belong to Vietnam prior to 1933, a FALSE fact that has been used to reinforce another FALSE information. 6. How had China obtained some islands after WW2. At the end of WW2, Chinese troops went to the Islands to disarm surrendering Japanese troops and Chinese troops refused to withdraw after the disarmament. In 1945, in accordance with the Cairo and Potsdam Declarations and with American help, the armed forces of the Republic of China government at Nanjing accepted the surrender of the Japanese garrisons in Taiwan, including the Paracel and Spratly Islands. Nanjing then declared both archipelagoes to be part of Guangdong Province. In 1946 it established garrisons on both Woody (now Yongxing / 永兴) Island in the Paracels and Taiping Island in the Spratlys. France promptly protested. The French tried but failed to dislodge Chinese nationalist troops from Yongxing Island (the only habitable island in the Paracels), but were able to establish a small camp on Pattle (now Shanhu / 珊瑚) Island in the southwestern part of the archipelago. In 1950, after the Chinese nationalists were driven from Hainan by the People’s Liberation Army (PLA), they withdrew their garrisons in both the Paracels and Spratlys to Taiwan. In 1954 France ceased to be a factor when it accepted the independence of both South and North Vietnam and withdrew from Indochina. China has no basis to claim the Paracel and Spratly groups of Islands on possession by succession. The trick of using fake documentation, fake evidence to cause irreversible damage to opponents had been known for thousands of years in China and many such cases had been recorded in Chinese history. The trick is also applied by propagandists in all countries . The current case of some Wikipedia entries had been manipulated is just an application of it in modern time. [2.20] The Hoang Sa and Truong Sa Archipelagoes: Vietnamese Territories. [2.21] The Hoang Sa and Truong Sa Archipelagoes: Vietnamese Territories, 1 – 2. [2.22] The Hoang Sa and Truong Sa Archipelagoes: Vietnamese Territories. It has been predicted to follow this path. There is no difference between a cryptocurrency mania and a tulips mania. One of the greatest asset bubbles of all time appears to have just burst. It’s not the stock market. Despite recent downside volatility amidst bubble-like valuations, so far stocks have merely entered a correction. Cryptocurrencies, on the other hand, have entered into a full-blown meltdown. Bitcoin will go down in history for its extraordinary rise from zero to a high of $19,783 on December 17, 2017. Its subsequent fall may be one for the history books as well. In the second half of November, Bitcoin prices fell through a months-long trading range, triggering heavy selling down to around $3,500. 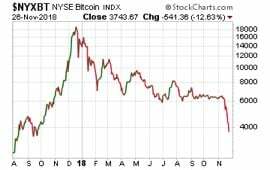 Anyone unfortunate enough to buy Bitcoin at over $19,000 now faces a loss of more than 80%. Losses are also staggering for Bitcoin Cash, Ethereum, Ripple, and many others.